When the chilly, blustery days of fall roll around, it is super satisfying to reach into the pantry and pull out some comfort food that was created months earlier. What fills that craving for me? Homemade applesauce with cinnamon, allspice and a whole lot of flavor. And what makes that even more rewarding, is knowing how easy it was to make! Applesauce is a great way to preserve large batches of apples quickly – especially if your use a slow cooker. You can have delicious applesauce with very little effort. In fact, you make it while you sleep! Then you can freeze it or water bath can it to enjoy later when the apple season is long gone. 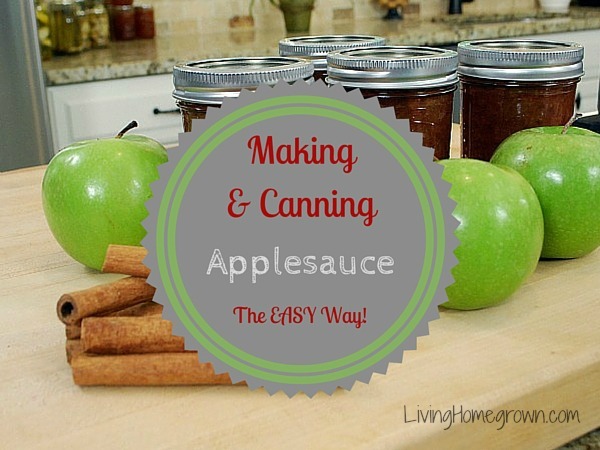 Making Applesauce is SO easy! The great thing about making applesauce is there is so much flexibility and choice in how you make it! To start, you can use as many apples as you want. And you can also mix and match different apples to create different flavored applesauce. And yes, you can skip the sugar! I don’t use sugar when I make my canned applesauce. Other than sweetening, recipes call for sugar to preserve the color of the canned product. So if you don’t mind a darker product AND you throw in a few sweet apples to counter any tart varieties – well, you are good to go. If you’re using really tart apples like Granny Smith, you can counter the tart by throwing in some sweeter apples like Fuji or Honeycrisp. That’s all there is to it. You can also add any spices you want. My favorites are cinnamon and allspice. But you can play around with that part as you wish. And, it’s absolutely up to you whether you leave the peels on or take the peels off. It works both ways. This recipe is just a guideline. You can make it with 5 apples or 20+ apples – whatever you can fit into your slow cooker. The amount of cinnamon and allspice is your own preference. But just keep in mind that the apples will reduce by 60%. You can always add more spice before canning or freezing, but you can’t take it out. So, be careful! I usually add 1-3 tsp cinnamon and 1/2 tsp allspice to about 10 apples. A printable version of this recipe is HERE. Squeeze the lemons into your bowl of water and set aside. Then peel (if you wish) and core your apples. If you peel them, you can just cut them into large chunks. If you leave the skins on, chop them a little bit finer so the skins are in smaller pieces. Then add the apples to the bowl of lemon water as you go to prevent browning. Once all the chopping is done, drain the apples from the lemon water and place them into the slow cooker. You can now add spices but don’t overdo it! As it cooks the flavors will become more concentrated. You can always add additional spices later. My recommendation for about 10 apples is 1-3 teaspoons of cinnamon and a half teaspoon of all spice. After the apples are in the slow cooker, turn it on high for about four hours, or on low overnight. I prefer to cook it overnight so you wake up to the wonderful fragrances. Plus, it makes it painless to process the apples over two days. Once that’s all done, you have to decide how you are going to preserve your applesauce. You can either freeze it or can it. At this point, you are ready to can your applesauce. But don’t fill your jars directly from the slow cooker. You must transfer the applesauce to a pan and heat it to a boil just before putting it in the jars. This is just to ensure the food will reach and maintain the proper temperature inside the jar during the waterbath process (for safety). Meanwhile, transfer the cooked down applesauce to a medium-sized saucepan. Over medium heat, bring the sauce to a boil. Fill the canning jars, leaving a 3/4-inch headspace. Wipe jar rims with a clean, damp cloth and add lids and rings to finger tight. Place jars in the water bath canner and process for 15 minutes. Remove lid, turn off heat and let the jars sit in the hot water for an additional 5 minutes before removing to a wooden board to cool. After they are completely cooled, any unsealed jars should be stored in the refrigerator and eaten within 5 days. Sealed jars can be stored on the pantry shelf and are best used within 6 months. After that time, they begin to darken considerably. Most applesauce recipes require at least a splash of liquid to prevent burning. But because this is done in a slow cooker, no liquid is necessary. It won’t burn. However, if you wish to cook this in a pot on the stove (instead of a crockpot), you need to add 1/3 cup of apple juice or water to prevent scorching. Cook on low until soft (25-35 minutes) and then mash the apples with a potato masher before adding to the jars. No time to can? Freeze it! Make the recipe up to step 4. But instead of reheating and canning it, simply fill freezer safe containers and pop it into the freezer. Leave lots of room for expansion. (At least an inch for freezer-safe canning jars). Label and use within 6 months for best results. I just listened to your podcast, while it was interesting I thought you missed one of the easiest way to make applesauce – use a food mill! I do not peel or core my apples, just cut them in half (or quarters) and put them in a pot or crockpot to cook down as you described. When they are soft, run them through the food mill and you’ll get no seeds, no skins and no work to core and peel! Great info Margaret. Thank you! Love the idea of overnight cooking, but I need to get through a lot more apples than than. Still maybe I’ll try this overnight and serve apple sauce for breakfast. When talking about freezing applesauce, can I use my vac seal bags? If so, how much, if any, room will I leave in the bag? THank you! Theresa, I’ve seen a lot of articles on making a combination apple/pumpkin butter and water bath canning it. What are your thoughts. Incidentally I have read your article on NOT canning pumpkin puree, but I wondered if adding apple, lemon juice and spices changes things. I’m curious why the apple pie filling “must” have the lemon juice added before canning, but the applesauce recipe does not. Also, I made pear sauce a few weeks ago. It was really hard to find a pear sauce recipe, and I basically went with an applesauce recipe. In looking at different recipes, some called for lemon juice and some did not. When I saw that yours did not, and yet your apple pie filling did, I just became further confused. I did add some lemon juice to my pear sauce, just to be on the safe side. Haven’t tried it yet though. I’m confused about why the apple sauce recipe doesn’t require lemon juice while the apple pie filling does. I see that lemons are used in the water while preparing the apples for the sauce, but I can’t imagine that’s the same as actually adding lemon juice for the processing. Can you elaborate on why it is NOT needed for the apple sauce. So sorry for the repeat question. My original post wasn’t showing up and I figured I’d messed up the other day and not actually posted it. Apparently my browser just needed to be refreshed. My bad. I only use a pressure canner and have trouble finding processing guides for items that are usually processed in hot water bath canner. Need this information for foods like applesauce and tomatoes. Thanks!